Having your kitchen organized and clean can save you a ton of money. Now that sounds strange doesn’t it? But it’s true, it’s shown that when someone keeps their kitchen clean and straightened, they’re more likely to cook in rather than eat out. And I get it, sometimes the kitchen can be an overwhelming place to work. It’s easy to let the dishes pile up and the cabinets become a messy stack of pots and pans. 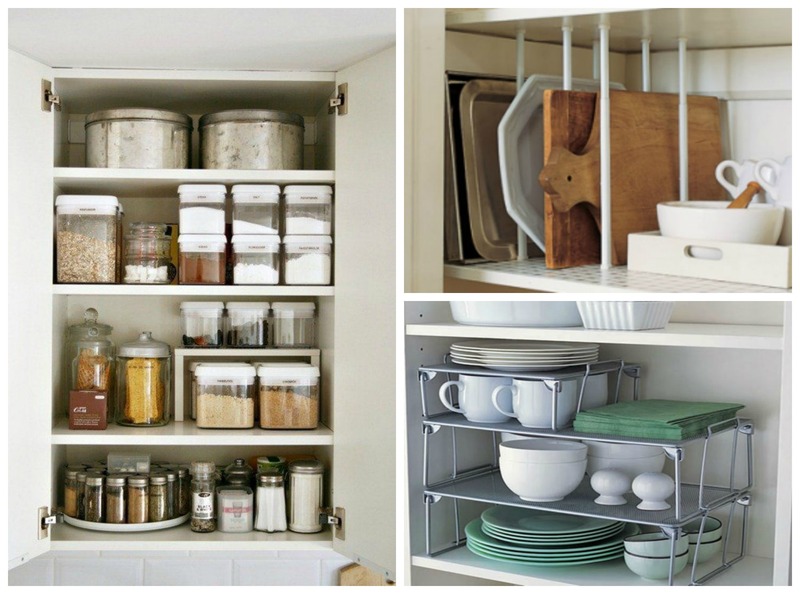 But thankfully there are some great ways to keep things organized in your kitchen, and especially in your cabinets. Down below I found some awesome cabinet organization hacks and tips from some amazing bloggers that’ll help you get creative in getting your kitchen easy to navigate. So feel free to check them out and then head to the bottom to find the tutorial! Instead of stuffing your kitchen drawers with oven mitts and hot pads, try using an adhesive hook to hang them on the inside of a cabinet door. Now you’ll have more room to store other important appliances in your kitchen! You can adhesive command hooks here ! Clear labeled containers are an aesthetically pleasing way to organize your cooking and baking supplies. Also, a Lazy Susan isn’t a bad way to keep your spices easy to grab (and it looks pretty darn cute too!). You can get Lazy Susans here ! Now if you’d like a handier option to store your dishwashing supplies (rather than crowding the counters), then a wire basket with adhesive hooks is a great way to go! You can get a wire basket and adhesive command hooks here ! A great way to store your relatively flat/thin baking and prepping (cutting boards) supplies is to use dividers that will keep them vertical to allow for easy access and more storage space. Sorry, but I had to share this one as well. I thought that this more simple vertical solution was also a great idea! If you’d like a creative way to store cleaning supplies below your sink, having pull-out wracks is a great way to do it! I really love how this tutorial shows you how you can easily keep things organized and easy to reach with just the use of Lazy Susans! They’re relatively inexpensive which makes them a great organizing solution. If you’re a baker and love to create new things all the time, then this organization tutorial is just for you! Seriously, when you cook/bake a lot, things tend to get pretty disorganized, which is why I love this easy storage solution. I hate it when you have to stack dishes on each other (Ex. small plates on top of large plates), which is why I really like this organization idea of using mesh shelves to keep things easy to grab. You can get stackable mesh shelves here ! If you have a lot of trouble with keeping your kitchen cabinets organized and clean, then I think some of these tutorials and ideas will help you out alot. I mean the kitchen is probably the most easily messy room in the home since we use it so often. So why not find a few hacks to help you keep it put together? Now if you have any questions on kitchen storage and organization, just let me know! I’d love to help you out!